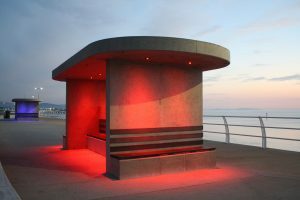 Anolis LED luminaires have been specified to bring colour, brightness and additional vibrancy to the Welsh seaside resort of Rhyl. They are used to light key landmarks in the Town including the 76 metre high Sky Tower which is prominent on the seafront skyline. 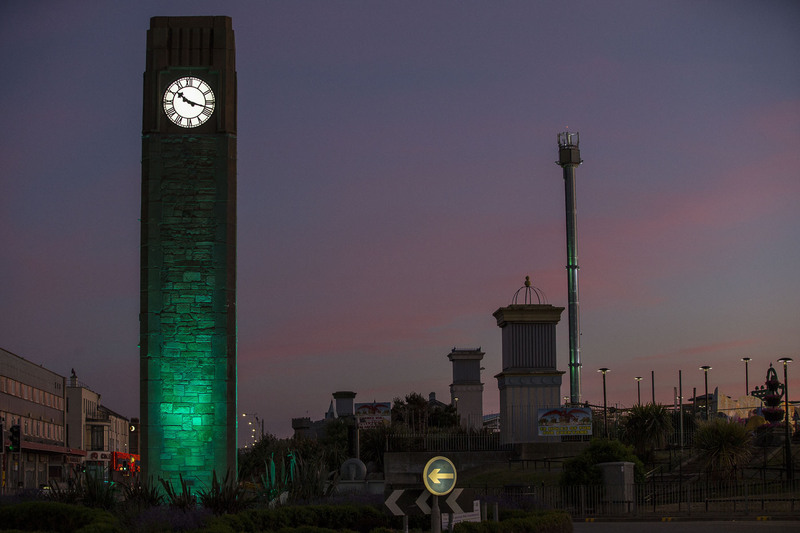 Additional lighting installations currently include the front façade and the fly tower of the Pavilion Theatre, the clock tower, seafront waterfall and new sea wall viewing shelters. 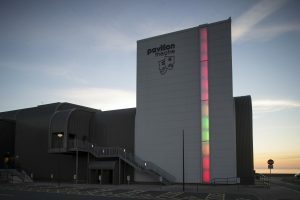 Andy Hughes, technical manager of the Rhyl Pavilion Theatre specified the Anolis fixtures in conjunction with Anolis UK technical sales specialist Simon Gooding. 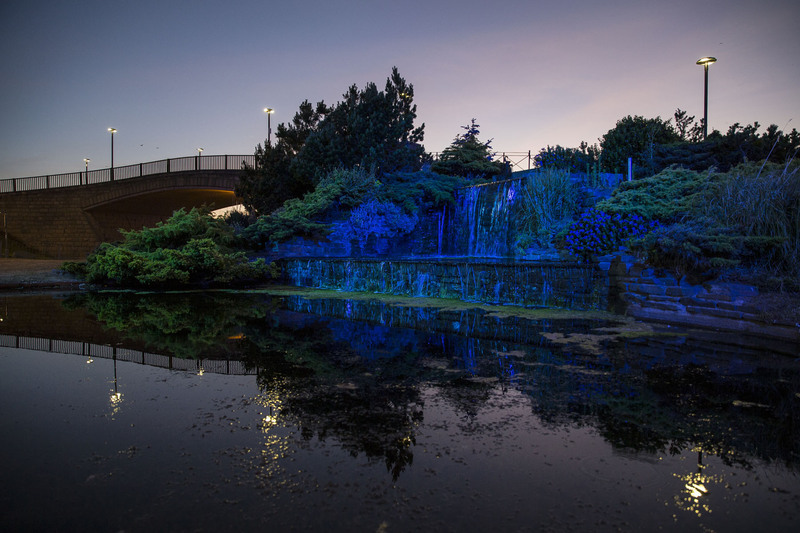 Andy works as a lighting consultant and advisor for Denbighshire County Council on their extensive ongoing waterfront urban regeneration project for Rhyl. He is also co-ordinating and making sure the various lighting schemes are installed smoothly. Andy chose Anolis because of the “excellent build quality, clever engineering the smooth colour mixing and because we wanted to use premium products that we knew would last” as well as for the “great service from Anolis UK”. 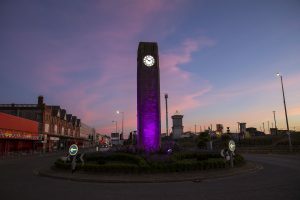 Rhyl first became a popular tourist destination during the 19th century when Victorian seaside culture was in its heyday, however, by the late 20th century fortunes had changes and the area was in serious decline. 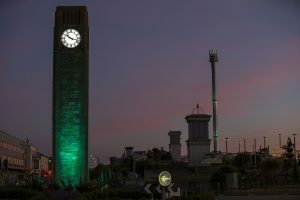 Seeking to reverse this nosedive and reenergise Rhyl as a thriving resort and a dynamic melting pot for locals and visitors alike, a complete ongoing waterfront regeneration plan was launched by the Denbighshire County Council’s leisure department. This followed an understanding that investment would come to the area once the waterfront scheme was up and running. The lighting schemes are an integral part of this bigger picture. Because of this, people stay in the area for longer periods throughout the evening, in positive surroundings. It also raises the profile of the town. 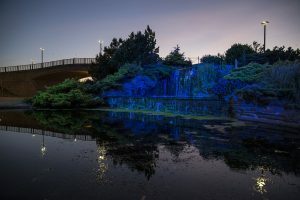 The first phase of lighting involved highlighting the sea wall and three new viewing shelters, part of constructions to fortify the flood prone town which is regularly lashed by storms during the winter and vulnerable to tidal flooding. 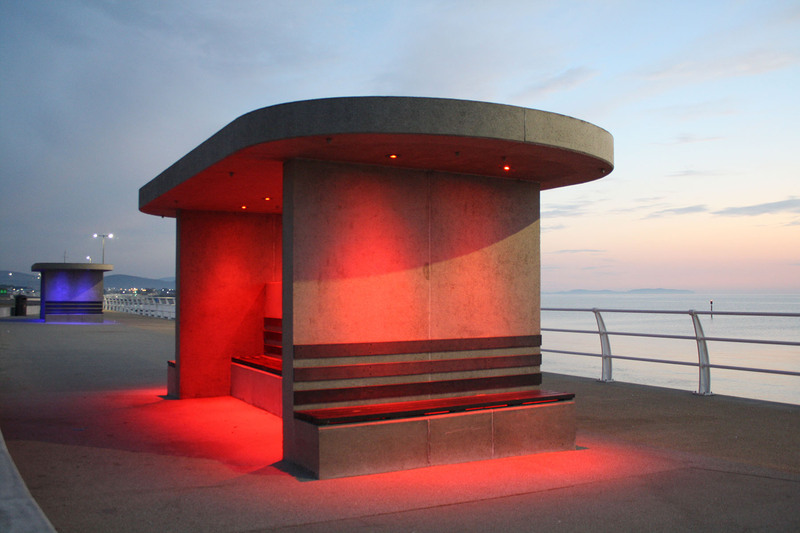 The shelters are built from concrete and although Andy wasn’t involved during the first phase of the design process, once the idea of lighting them was mooted, the physical design was changed to fit the Anolis ArcSource 1MCs RGBW which were specified for illumination. Twelve ArcSource 1MCs are installed in each shelter, driven by Anolis Outdoor ArcPower units and DMX controlled via a Pharos system. This was completed in 2016, and proved a great solution for an extremely hostile environment. 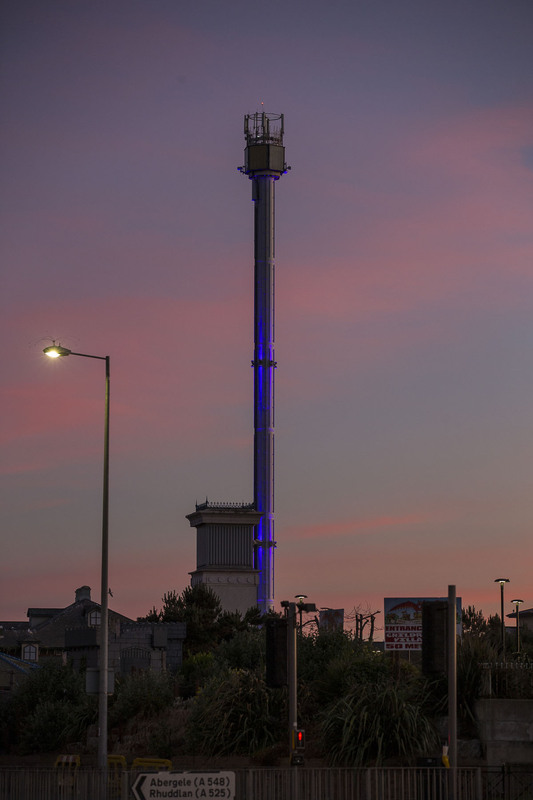 When it came to completing the Sky Tower and Pavilion Theatre facade lighting at the end of 2017, with the success of the Anolis products in the shelters, Andy had no hesitation in returning to the brand. 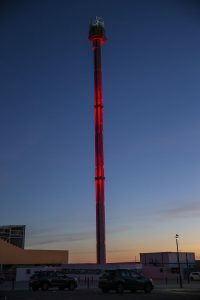 The fixtures are rigged on a special ring bracket secured around the tower – donut style – at 106 ft. from the ground, around two thirds of the way up, integration was provided by Anolis Partner LTP Integration. The Sky Tower is highly visible when lit and symbolic of the confidence and success that has returned to the town with this ambitious urban renewal masterplan. 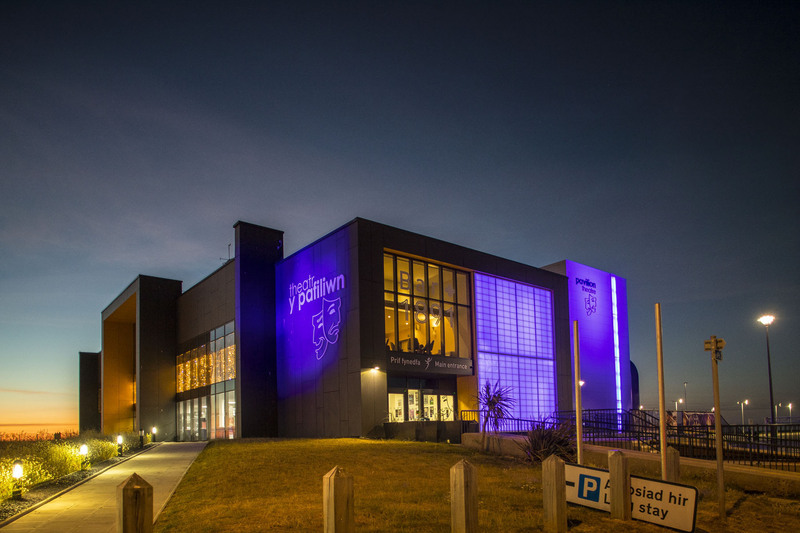 The current Pavilion Theatre is located on the East Parade seafront, which is in the Waterfront regeneration scheme. 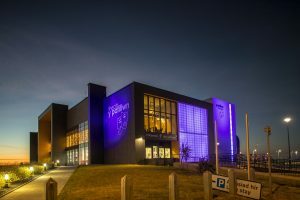 An opaque Perspex strip covers 13 x Anolis ArcLine Optic 36 RGBW linear luminaires running up the exterior of the tower, and another 12 linear luminaires – six per side – highlight a large panelled area on the venue’s front façade, positioned 15 ft. apart. “We really wanted something different and interesting to light the theatre front” explained Andy, ‘Something more than just a conventional wash look, and the breadth of the Anolis range gave us many options including this one, which was just what we wanted”. Essential bi-lingual signage (English and Welsh) on the theatre is picked out with a couple of Anolis ArcSource 96 Integral RGBW wireless units (with 13 degree optics) complete with a custom made top hat to stop road glare into traffic, which are linked into the same Pharos control system running the Theatre façade lighting . Andy comments, “My colleagues and I are all very proud to be involved in the regeneration project, and it’s inspirational to see lighting features become a big part of the town, in turn attracting people and encouraging commercial enterprise and activity”. ANOLIS is an architectural lighting division of ROBE lighting s. r. o.